Investment accounts grow either from adding more money to the account or from account growth due to returns and appreciation. The more time until you need the money, the less you must personally contribute because compound growth begins to work in your favor. 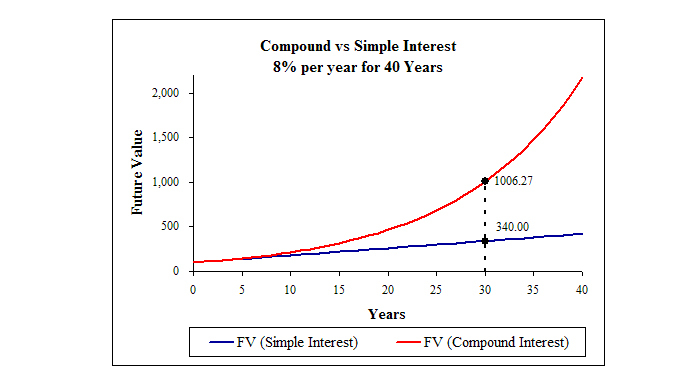 Compounding is essentially interest paid on interest, which allows for faster growth. Here is a graph which illustrates the point. To gain the most from the impact of compound growth, you must choose accounts that will work efficiently during your accumulation years, leaving you with more money in retirement. Unfortunately, there is an endless array of places to invest. Most will not meet your specific needs. The object of wise investing is not to learn everything about all your investment choices, but to study a few strategies that will work for you, and to be diligent in those efforts. Increase your contributions. If you do not have a saving or retirement account, start one. You can begin with as little as $25 a month to get started with long term goals and a few dollars a month for short term goals. Large sums of money do not grow overnight, and you will not suddenly have extra money to contribute sometime down the road. Wherever you are, start today, contribute to each account every month, and increasing amounts at least annually. Understand the risk of each investment. All investments have a risk. You must choose which risks you can accept. For example, a CD which pays 1% has interest rate risk. You could be locked into a low rate when interest rates rise. An individual stock has industry risk. The entire industry could face a crisis, resulting in a stock price decline, even if the company is stable. Understand the risk of your chosen investments and find ways to mitigate those risks, which will stabilize the investment portfolio and potentially increase the overall rate of return. Study your strategies to reduce fear. Few investments offer guarantees. Markets, interest rates and the economy consistently go up and down. Understanding why you are making certain decisions will help you sleep better at night. Sitting on the sidelines results in taking more risk as you look for fast money to make up for lost time. What are you trying to accomplish? Understanding your goals will largely dictate, what options best meet your needs. For short term goals, you need investments that preserve capital, and you can access immediately. For mid-range goals (five to ten years) you can take some market risk, but may have limited recovery time if the economy turns. Long term goals give you more time to account for market volatility and allow you to take full advantage of compounding. You use different strategies to build an emergency fund than you use for a retirement fund. Focus on market trends rather than quarterly reports. For long term investments, you want to find upward trends. Watching the account each day as it bounces up and down is needlessly nerve-racking. Stocks and mutual funds can fluctuate from day to day and month to month. When you understand your long-term strategy, you can look at your statement each month or quarter and focus on your goals. Meet with a financial advisor at least once a year to rebalance the account and ensure you are headed in the right direction. Life changes can require adjustments to your strategy. Stocks versus funds. Stocks carry more risk because it is one company. A fund (ETF or Mutual) is a group of companies. When you buy a fund, you could get 20 to 500 companies in a single fund, which balance each other out and build a diversified portfolio with fewer dollars. Funds can invest in multiple industries, company size, and even countries, allowing you to get a piece of the action without requiring thousands of dollars to get started. Do you understand the investment? Never invest in something you do not fully understand. There are a lot of complicated investments on the market, promising above average returns. When you are behind in your retirement goals, it can be tempting to try a few out. However, if you do not understand how the investment works, you cannot evaluate your risk and could end up with losses instead of gains. You should be able to explain any investment to a friend. Being overly Fear can lead to ultra-conservative decisions, which limit progress and require more cash out of pocket. You must match inflation to break even. For true growth, you must beat inflation consistently, which in many cases, eliminates the most conservative options. Take the emotions out of the decision. Investing is not a fast action thriller, as depicted on television. Most people don’t turn into millionaires (or paupers) overnight, and most of the action happens slowly over many years, not days or weeks. In our fast-paced world, you can grow impatient waiting for money to accumulate in the account. Use a professional. If you struggle with finances, get help. A financial advisor can help you choose appropriate investments based on your Some advisors receive a commission based on recommendations, which is not a direct cost to you. Other advisors charge a flat fee or a percentage of the investment. They can help keep you motivated and give you direction and answers to your questions. Keep it simple. You do not need to get rich overnight or even beat the market, but you must regularly and consistently add money to an account that will grow over time, leaving you with enough money for retirement. The process is slow, requiring both patience and time, but does not need to be complicated. Sometimes the best strategies are both simple and boring. Pay attention to fees. The cost of the investment impacts the rate of return, much like taxes do. Early penalties, annual account fees, and advisor fees can all chip away at your money, leaving you with less. Understanding investments does require a little time and dedication, but the rewards are a secure retirement and enough money to do as you please when you stop working. A small price to pay for long-term peace of mind.